Bianca met Vitor soon after his conversion to the faith. Although Vitor says it was “love at first sight” for him, Biance needed time and prayer to decide if she wanted to be in a relationship. It was time apart well spent, because she soon began to have feelings for Vitor and an attraction to the path of sanctification through marriage. Their story continued, together and apart. And then it culminated in front of the Eiffel Tower on a trip to Rome, where Vitor asked Bianca to be his wife. In Bianca’s Words: Vitor and I met at a parish in Rio de Janeiro through mutual friends. I was engaged in pastoral activities at the time and reflecting on my inner life and vocation. He had recently returned from a retreat and was determined to convert to the Catholic faith. The moment he saw me, he said it was love at first sight. After Vitor approached me, we began to have more frequent contact until he asked to make it official. But I ended up moving away, because I wasn't thinking about a relationship at the time, and due to external interference, I felt a little pressured. We continued as friends. He had some difficult moments after I moved away, but Vitor gave his whole heart to God. In the meantime, I discerned my path and began to see marriage as my means of sanctification. A year and a half later we approached each other in a different way. After a sincere conversation, I was able to understand more about what was going on with him, and we were able to get to know each other better. It was indeed God’s providence that united two hearts seeking his will, and I realized that I began to feel the same as Vitor was feeling for me. It was close to Lent in 2015 when we decided to see each other more and pray together. After this, Vitor talked to my parents and asked me, officially, to date. That was April 8, 2015. In that same year we discovered a path of sanctification in the midst of ordinary life inspired by the way of Saint Josemaría Escrivá. This organization is known as Opus Dei. That transformed our lives and our relationship. We went through many moments of joy and difficulty that made us stronger. And in 2016, we mutually ended our relationship, to improve ourselves separately. That wasn't easy, but we were determined to put God in the center of our lives, fighting for and relying on his will. We quickly realized that we wanted to walk the path to sainthood together. So Vitor, very affectionate as always, again made the request to date me in front of the sanctuary of our parish. We began to receive more intense formation through the prelature of Opus Dei. Together, we grew in a life of piety, and we became closer friends, always talking about everything and dreaming about our marriage. Last year, during March 2018, we had the grace to spend Holy Week in Rome for the UNIV Congress. We went with a group from Brazil to participate in academic activities and celebrations with the Pope. Our flight to Rome had a connection in Paris, France. As soon as we arrived in Paris, Vitor and I visited the Sacre-Coeur Basilica, and then we went to visit the Eiffel Tower. He had already prepared everything for this moment. He had talked with my parents, asked for their blessing, and we had talked with his parents and our spiritual director, who blessed the wedding rings. He was also nervous, since that moment represented a new, great, and beautiful stage of our life together. I realized he was acting different, but I thought it was because of the excitement of the trip, with many new things happening at once. We spent some time around the Eiffel Tower, talked a lot, and took photos. When I suggested we leave, he wanted to ask someone to take a picture of us, because we were only taking "selfies". We asked a girl to take a photo of us in front of the tower, when Vitor suddenly asked to get gloves in his backpack because he was cold. He crouched down, put his backpack on the ground, and removed the box with the ring. He knelt in front of me and asked, "Bianca Dantas Quevedo, will you marry me?" I felt an explosion of feelings while the girl continued to photograph everything. Vitor asked me to marry him on March 20, 2018. We always talked about marriage, and we were preparing ourselves for it, but the time of the proposal was special and a complete surprise. We were both very excited and happy. I said "yes" with all the conviction of my heart. The proposal was a beautiful start to our trip. We went on to spend Holy Week in Rome, thanking God and asking that his will always be done in our lives. We are getting married on January 4, 2020, and ask for everyone’s prayers! Vitor always had a desire and a certainty in his heart: to marry, to build a large family and to be close to God. So we want to build a large family and a bright and cheerful home. Vitor and I realize that God gives a special grace to this new phase. He makes us stronger, more determined, and matures us to embrace the great mission of marriage. Read more here for the story of Elizabeth and Matthew’s wedding, a “taste of the eternal wedding feast” in a magical Irish castle. Elizabeth and Matthew met in Ireland in a study abroad program in college. 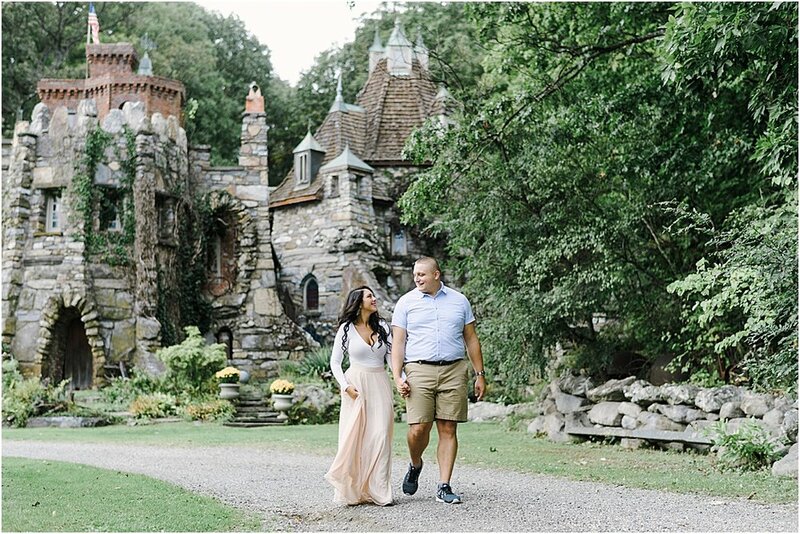 Their fairy-tale introduction at the top of a castle became a very real and fruitful relationship. As they discerned marriage together, they helped each other grow in love for the Lord. Matt eventually took Elizabeth back to Ireland as a gift, and after a brief set-back and improvised castle tour, proposed to her in the country where they met. “Incandescently happy” after their engagement, Elizabeth couldn’t believe that “life could be so beautiful and abundant.” And yet beauty and generous abundance is exactly what the Lord desires to give every one of his children. In Elizabeth’s Words: Before I met Matt, I prayed a novena to St. Anne for my future husband, and I met him on the ninth and final day of that novena. I didn't tell him that until we were engaged. We met in a castle while studying abroad in Christendom College’s Ireland program. It's a true story, I promise, and was something we never could have planned! As Matt would tell it, I was late and he was early. I had been traveling with my brother before meeting the student group in Ireland, and we met them on their first day at their first stop: Bunratty Castle. Matt says, to this day, that he waited until he got to the tallest tower of the castle to introduce himself because he wanted to make a good impression on me. He did. Afterwards when I was dating Matt, God made it consistently clear that he was the man for me, for many reasons. One of these reasons was Matt’s deep and wise faith, which he really cultivated and grew in college. I admired that, and it made me hungry to know Our Lord more fully and also to love His bride, the Church! I used to tell Matt that I fell in love with God long ago, but it was dating him that really began my love affair with the Church. I believe my contribution to Matt’s faith-walk came in a humbler way. He tells me often that my love of the Father, this 'Abba' of my heart, inspired him to pray differently and seek to love the Lord more deeply and personally than he had before. It is beautiful that God, in his wisdom, knew how we needed to complement each other. We were both adamant throughout our dating relationship that we were discerning a unique vocation to marriage with each other, and we tried to be intentional about that in our conversations and prayer life together. We discovered we had the same dreams for life and the same ultimate goal of heaven, and we both discerned that God was calling us to each other to help us reach those dreams. After a few years of dating and graduating from college, Matt took me back to Ireland as a gift. He invited my siblings and a few close friends to join us, so I couldn't have asked for a more treasured crew. He was smart because he immediately put me off the scent and told me I shouldn't expect an engagement to happen. Matt was still saving for a ring, and paying for the trip was expensive. I was completely oblivious. My darling friend Anna always tells a story about the night before we all left on this trip. She was talking to her dad, and he asked, 'So Lizzie knows she's getting engaged on this trip, right?" Anna replied, "Nope, somehow she has no idea whatsoever." She even had to make sure I was wearing cute clothes the day Matt proposed because I was not thinking about it at all. We arrived back in Ireland on Monday morning as a group and drove up to stay at Ards Friary. This was where Matt and I spent our first summer studying, praying, and having fun together. It brought back a flood of happy memories. On Tuesday we drove down to Knock Shrine and attended daily Mass. We then drove to Ashford Castle, where we experienced a falconry lesson for the first time. It was so fun! Afterwards, Matt walked with me to the back of the castle. It was like something out of a fairy tale, situated on a lake with pristine gardens. I didn't know it at the time, but he had to quickly change plans right before he proposed because the bagpiper wasn't ready yet. One of the concierge guys swept in to help Matt by distracting me. He offered give us a tour. I was a history major in college, so when he started telling me things about the house that didn't add up, I thought he was the worst tour guide ever! In reality, he wasn't a tour guide at all, but it was pretty comical. The tour was also incredibly short, only lasting about 3 minutes. I was confused and wondered what this guy was doing, but we left our funny tour guide and walked back to the garden by the lake. It was there that Matt proposed with a bagpiper playing the background, and I immediately started crying happy tears. He told me how I had helped him learn to love God as a Father and that he wanted to spend his life serving God by serving and loving me. Looking back, there really aren't proper words to describe the euphoria of a moment like that, but “incandescently happy” was a phrase that suddenly made sense. He pulled out a gorgeous three stone ring, telling me it was a reminder that God would always be the center of our home. As soon as i managed a 'yes' through my tears, we were swarmed by my two brothers and sister. Everyone was crying, and everyone was happy. The next thing we did was FaceTime my parents and Bella, my little sister with special needs. She started smiling as soon as she saw us. I think she knew what was up! We spent the rest of the day on a boat on the lake drinking cider (my favorite) and loving every moment. I pinched myself, overwhelmed by blessing and in disbelief that life could be so beautiful and abundant. Matt is truly a princely man. He is honorable, wise, compassionate, funny, and brave. I felt (and still do!) like the luckiest girl in the world. We spent the rest of the trip touring Ireland and celebrating. To top it all off, Bono from U2 invited us for lunch at his home in Dublin to celebrate our engagement. My parents have known him for many years, and he actually knew we were getting engaged before I did--which almost resulted in me finding out by accident--but that's a whole other story. After many years together, Jessica and Chris took the next exciting step towards marriage. With Christ as their foundation, they patiently prepared to become one flesh. In Jessica’s Words: Chris and I have been together since we were sixteen. We were both brought up to consider Christ as a close friend, and we introduced each other to how Jesus had uniquely worked and loved within each of our hearts. I was happy and grateful that when he proposed, my family surrounded us and celebrated our beautiful moment with us together. The next day, I was very blessed to wake up early and attend Mass with my new fiancè. Praying together for the first time as an engaged couple proved to be a valuable foundation for our marriage preparation. We decided to set a date two years away so we could plan at our own pace, and this decision proved to be an important part in our journey. We were still learning how to present ourselves to God and others as one. A book that helped us to practice this and guided us through a God-centered engagement is Men, Women, and the Mystery of Love by Dr. Edward Sri. Even though my wedding day is months away, what I look forward to most is the people I love helping me celebrate our Mass through reading the Scriptures and bringing up the gifts. I also am eagerly anticipating the moment that I receive the Eucharist for the first time as a wife with her husband. A few months before her move to Kentucky, Johnna signed up for an online dating site. She didn’t want to put too much pressure on herself to find a husband, so she approached it instead as a way to meet new people in a city where she knew no one. Looking back, Johnna thinks this must have been the best way to approach dating, because she went on a date with Adam her first week in town! During their courtship, Adam was the strong and steady rock in a swirl of new experiences for Johnna: a new city, new job and, eventually, a new faith. As a recent convert to Christianity from Judaism, Johnna was intrigued by Adam’s Catholic faith. From the beginning, they had many conversations about why Adam was Catholic and what that meant for their potential life together. And so, as Johnna fell in love with Adam, she fell in love with the Church. Eventually, she enrolled in RCIA and came home to Catholicism eight months after they began dating. In Johnna’s Words: When Adam and I first started dating, I had just started a new job as a faith-based community organizer. This meant I was working with different volunteers from various denominations. I was Episcopalian at the time, and had been for five years. But there weren’t many Episcopal churches involved in the organization I was working for. Instead, the first church I worked with was a Catholic one. Right off the bat, I started having conversations with the Catholic parishioners of the church. I asked about their faith and the Church’s strong social justice doctrine, and I was amazed. I grew up in Alabama, which I later learned has one of the lowest Catholic populations, so many things I had heard about Catholicism weren’t quite true. When I started talking to these incredibly faithful men and women, they revealed the beauty of the Church to me. I have a close friend—now my matron of honor—who is also Catholic. I began asking her questions I didn’t feel comfortable asking strangers. And since I found out early in our relationship that Adam was Catholic too, I started asking him questions as well. I appreciated my previous church homes for their ability to inspire joy and happy emotions in me. But from Adam and the Church, I learned the beauty of logic and stability. Faith could be so much more than a Sunday morning high and a feel-good building. It could be history, learning, and deep understanding. And as I began to appreciate the depths of the Church, I began to learn what it truly means to love another person. My past relationships had been emotionally exhausting--mainly because I had looked at love as an emotion or feeling. Adam helped me realize love was a choice. Staying mentally, physically, and spiritually fit is important to us as a couple. So, many times, I began to think about our workouts in terms of our faith. He and I intentionally made time for fitness because we knew it was important, even if we didn’t “feel” like it. In the same way, we began to make time for Mass and prayer together even if we didn’t “feel” like it. I finally realized love was the same. I decided each day that I wanted to learn more about Adam and continue to share a part of my life with him. And despite panic attacks and bouts of depression that were a result of my job, he made the same decision with me. As time went on, I became confident that Adam would continue making the choice to stay by me no matter what was going on in our lives, in the same way Christ made the decision to offer himself on the cross for the Church. So when I came home at the start of my Christmas break to find Adam down on one knee, holding out a ring, I didn’t hesitate to say yes. I remember a conversation with a woman, the RCIA teacher, right before my first date with Adam. We were talking about my desire for marriage and family. She suggested I read the book of Tobit and pray to St. Raphael. And of course, she also let me know I was welcome in RCIA class on Sundays before Mass. Just to drop in and check it out. She even gave me a bible and a St. Raphael prayer card. I didn’t know how I felt about praying to saints yet, since it wasn’t something that was looked kindly upon in my Southern Baptist-filled hometown. But I decided to give it a shot. I didn’t think about it on my first date with Adam. But a few months later, after I was officially enrolled in RCIA and was picking my patron saint, I asked Adam who his confirmation saint was. Lo and behold, it was St. Raphael. When he asked me to marry him, I started crying tears of excitement. I was ready to be united with the love of my life and believed that nothing could stand in the way. Little did I know that nine months of marriage preparation, wedding planning, and managing family expectations would present a journey of challenges before we could walk down the aisle. Although wedding planning was one of the most materialistic and difficult times in my life, I chose to enter the wedding industry to bless couples as their photographer and as a source of encouragement. We offer both beautiful images and positive support; we remind couples to embrace the hustle and bustle of wedding planning tasks by slowing down and enjoying engagement. Your time as an engaged couple can seem extremely long and difficult due to a multitude of new situations, pressures, and circumstances. But there are many reasons why it's one of the most formative times in your marriage. 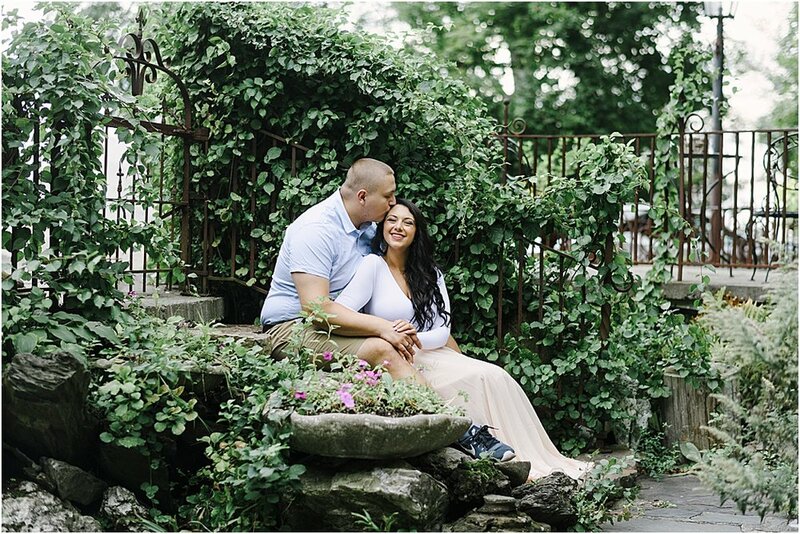 As a bride and a photographer, I have journeyed through many engagements with couples. I pray that my perspective may help you experience your season of waiting with intention and a grateful heart. Engagement is a precious time when you are able to communicate, discern points of conflict, and problem-solve prior to married intimacy. It's during this time you are making some of the biggest foundational decisions in your relationship, like where you will live, where you will work, and how you will celebrate the holidays. Take time to dive into every conversation and seriously begin working through obstacles as you prepare for marriage. Engagement gives you the ability to slowly unite as one. In other words, engagement offers a buffer of time to release old, selfish habits and to develop new routines for new life circumstances. Marriage is a vocation that immediately strips you of the ability to be selfish; engagement is a time to prepare your mind, body, and spirit for that kind of sacrificial love. It is important to consider how daily routines and household responsibilities will change after your wedding. Engagement allows you time to focus on Christ. It is this time of waiting that gives you space to communicate about your faith and pray together. Use this time to create a vision for a shared spiritual life and goals for your new family’s foundation of values. Engagement can be a challenging time to balance physical temptation, external pressures, emotional distress, and deadlines for key wedding planning decisions. But this time won't last forever. Years from now you will look back on this season and it will be a small dot on the timeline of your marriage. With this in mind, utilize this season to its fullest by discerning issues, growing in selflessness, and focusing on Christ. After taking this time to build your foundation, you may even find the first year of your marriage will be easier than you expect! About the Author: Sinikka Rohrer is the founder of Soul Creations Photography. She is a go-getter and dream-chaser who loves to serve others well. She loves all things healthy and early morning spiritual reads. Most days you can find her walking hand in hand beside the love of her life, Alan, with their baby John David in her arms. On any given day, you'll find them taking hikes and planning vacations out West. Read more here for the story of Melissa and AJ’s wedding, a tale of devotion to the Lord and his Blessed Mother, and a wedding day completely enveloped by peace. Melissa and AJ met at church through a mutual friend in 2016, and they were married less than two years later in 2018. Their love story is a whirlwind of romance, faith, and Marian devotion. Even AJ’s proposal, which didn’t unfold completely as planned, was filled with intentionality--from the ring he had custom-designed to the final love letter he presented to his future bride. Through the intercession of Mary and the Blessed Virgin’s parents, Sts. Joachim and Anne, AJ and Melissa were graced with the strength to promise the rest of their lives to each other. In Melissa’s words: A good friend who knew both of us well introduced me to AJ one night at church. That was July 19, 2016. A few weeks later on the solemnity of the Assumption of Mary, after a Latin Mass at the oldest and most beautiful Catholic church in Miami, AJ asked me on our first date. Two months later we had already begun talking about marriage and the good things in store for our future. On the days leading up to the feast of the Immaculate Conception on December 8, we made our first consecration to Jesus through Mary by finishing 33 Days to Morning Glory by Fr. Michael Gaitley. We would later renew our consecration on our wedding day, April 21, 2018, at the very same church where he began pursuing me less than two years earlier. Looking back, he had been planning the proposal for a long time. I only knew it was coming because he could not contain his excitement, which was the sweetest thing. The summer after I finished grad school, AJ asked me to leave one particular Wednesday unplanned. I tried not to be suspicious, but that was the moment I really knew. I really thought I had it all figured out. Even though I was going to be hiking all day in the sun, I decided I needed to look my best since I strongly suspected he was planning to propose! I woke up early that Wednesday and got myself ready. This was in Moab, Utah, and he came to take me hiking at Arches National Park in the morning. The rest would be revealed as the day went on. There was no cell service in the park, and we both took advantage of it to unplug and enjoy nature. He drove me to Delicate Arch, our first stop. Unbeknownst to me, this was also where he planned on meeting a photographer to capture our special moment. We immediately spotted some park rangers, cones, and a roped off section of the park. I caught AJ desperately trying to cover up his look of, “this was not the plan!” Apparently, there had been flooding due to rain the day before, and the trail was closed. There was a local woman and her daughter who pulled up at the same time also asking about the trail. They explained that Delicate Arch was their favorite, so it was too bad it was closed. However, they had another favorite trail called Double Arch, and we could follow them over there if we wanted. 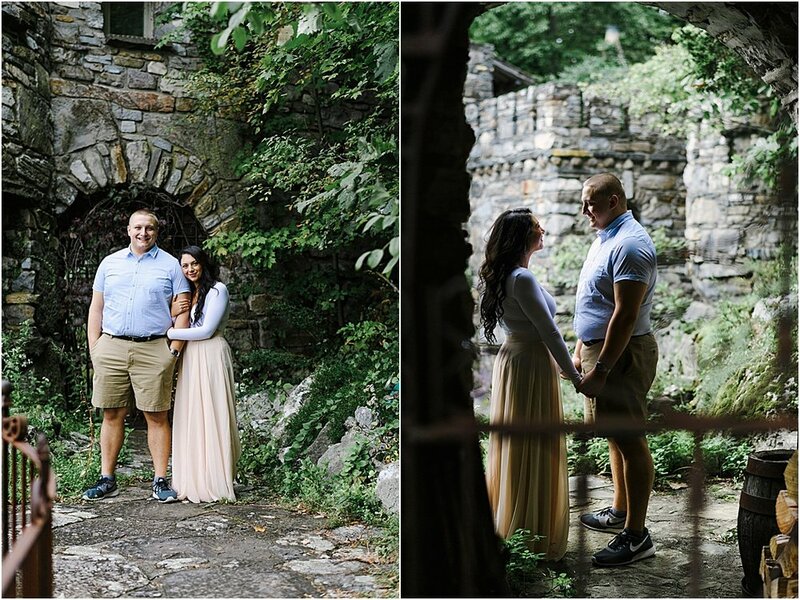 While all this was happening, I had no idea that this stranger was actually our engagement photographer trying to help AJ come up with a last minute backup plan! As we hiked up Double Arch, I took pictures of beautiful rock formations. AJ took my hand, and led me to the center directly under the main arch. He began to say a lot of lovely things that I would never have been able to remember, because I was so giddy and nervous and excited. But he had written them down beforehand. In short, he got down on one knee and asked me to marry him. AJ proposed on July 26, the feast day of Sts. Anne and Joachim, the parents of the Blessed Virgin Mary. They are also the patrons of marriage, among other things, and such an incredible example of marriage and family life. During the days leading up to his proposal, AJ prayed a novena to these two holy saints asking for their intercession in our future marriage. And the ring was beautiful. We had already gone to look at rings together two times. He knew exactly what I liked best. I had no idea that his mother had given him a diamond that she bought on a necklace when she was my age. He had taken her diamond to a jeweler and had the rest of my engagement ring custom designed based on what he knew I liked. It is the most special thing I own. To add to the special moment, July 26 was exactly three months after the day I received his first love letter in the mail. I received fourteen more letters during that time frame. He handed me the last one right after he put the ring on my finger. He had been asking me to marry him since April that year, and he finished his question on the best day, the day I said yes. I am so thankful that God made this man for me, who seeks the Lord with his whole heart and goes to God first before coming to me. I cherish our love story so much because it is rooted in faith and prayer, individually and together.